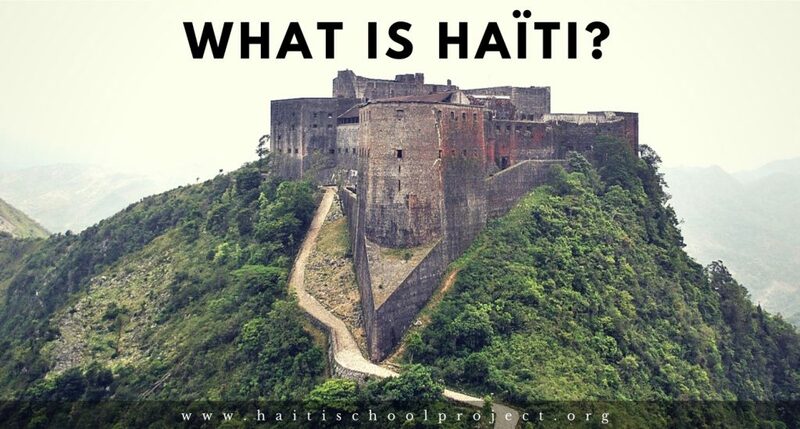 You’ve read all this and yet you still don’t know what Haiti truly is. Just like knowing someone’s name, birthdate, skin color etc. doesn’t makes you knowing them. Of course these data are useful but they are incomplete. To know something, one have to experience the actual thing. Technology have tried its best to deliver this experience with pictures, 360 views, videos, 3d etc. but we all know that facetime cannot show you what a real hug is. 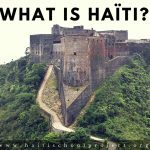 Just as this article cannot tell you what Haiti is, it’ll just give you a way to understand what it is, and your imagination will do the rest. 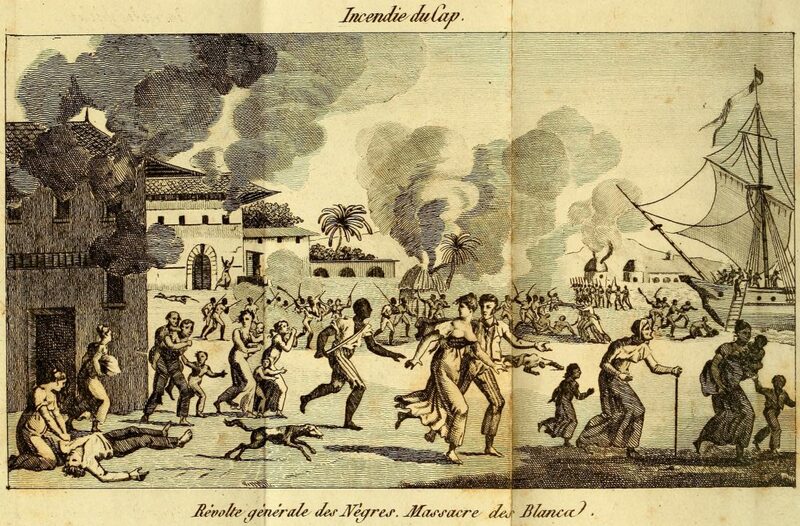 Haiti’s amazing past of: first black nation to be free from slavery, Christianism (which was also brought by the proslavery) and lead by themselves… The unknown future of the new elected president Jovenel Moïse which is in the political party built by former president Michel J. Martelly, a certain continuity is to expect… Considering both as useful data to help you understand the conflict between where we were and where we ‘think’ we are now. The only way to answer our question, is by visiting us today. And when you will come (I know you will, because that’s probably why you are spending your precious time reading this article, which is something I really appreciate), you will see all kind of things. From gorgeous breath-taking beaches at Labadi, Ile-à-vache; immersive hiking at Kenskoff, Furcy, Pernier, Milot, Terre Blanche to trash mountain around Portail-Léogane, Pétion-Ville’s public market and car station, Canape-vert. The experience can go from breath-taking landscape to breath-holding stench. But why the stench is greater and more affluent? A country, just like everything in this universe, is a hole and is part of a hole. As so it consists of different parts. Some more important than others but all are necessary for it to be. A country is made of people, without them it would just be an island. And its most important resource is its people. If 9 out of 10 million people are using the streets as their trash bin, no wonder why it stink. I wrote all this to show you that, a country is the person living in it. So Haiti is us, either Haitians or foreigners. If it is as corrupted as it is right now, it’s because of our day to day behavior. The behavior of one single person is the one of the entire country. If I choose to be lazy and spend several months without writing any article, how can I complain when the KEP (Konsey Elektoral Pwovizwa = Provisional electoral council) have made about 6 attempts before they can get to an acceptable election. It is me, as a Haitian to nail my behavior into how I want the country to be, because Haiti is… ME, Haiti is us, Haiti is every single person living in it at this very moment. Whether you are just visiting or native. If more person realize that Haiti is them, that Earth is us, we will think twice before throwing that plastic bag in the street, before selling our national telecommunication center (TELECO) to the foreigners, before we bride the customs for blocking electronics just so we can sell ours. We won’t do these things if we knew we were the hand pouring apart the country’s blood. So by doing the right action, in the right time with the right attitude, we can and will change Haiti into that right action. So if you choose the wrong action, Haiti will for sure continue to go wrong. 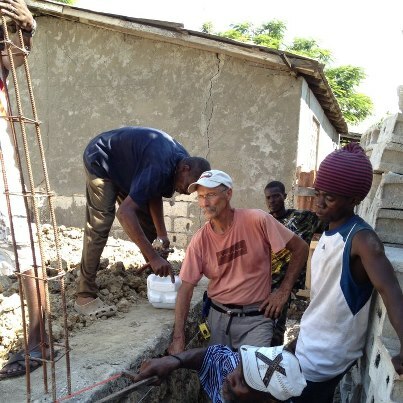 I think that if more and more people become aware that their everyday actions are actually what Haiti is made of, they will do things differently, which will lead to a brighter future. If you like my vintage point, and would like other people to know about it, feel free to share this article with them. 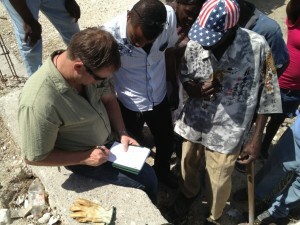 Maybe if enough Haitians adhere to it, things will change for the better. 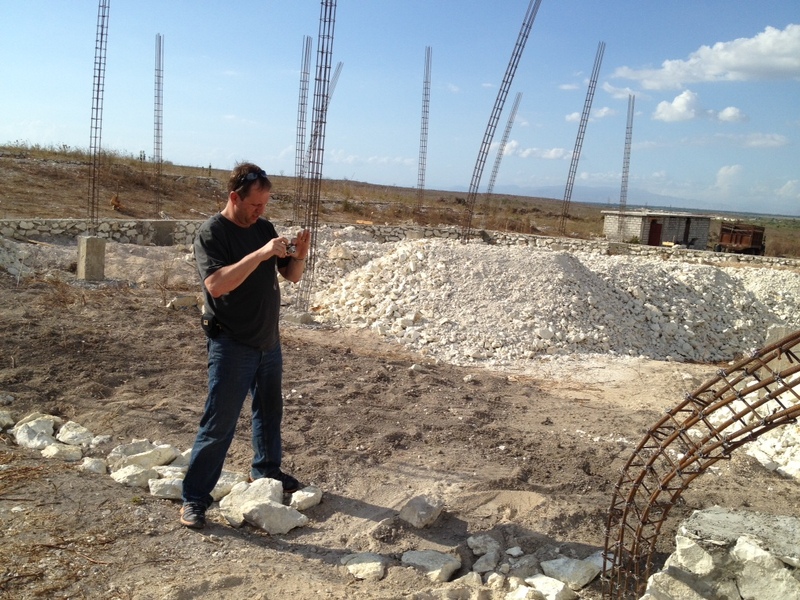 We have started the construction of the school in Villard! 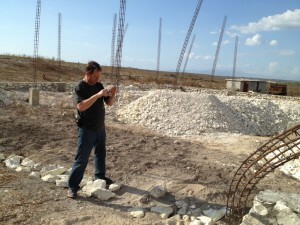 Tim has been working hard down in Haiti these past few weeks, buying materials and finding good construction managers. 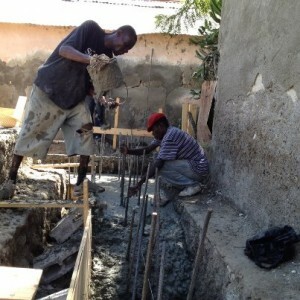 He has trained teachers on the latest post-earthquake building techniques and they have begun to pour concrete and are really diving into the construction. Thanks for all of your donations and support thus far. We are collecting donations to make sure that construction can continue until the school is finished! Donate now for matching funds and make your donation go twice as far! The dates are set for the teacher training workshop! 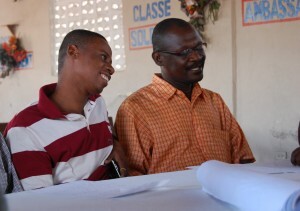 We will be meeting with teachers on August 6-10th and with principals on the 11th! 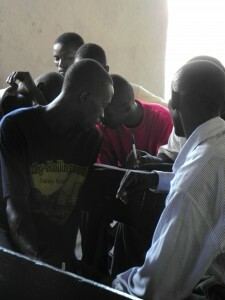 Keep checking in for updates on the project as the workshop comes near! 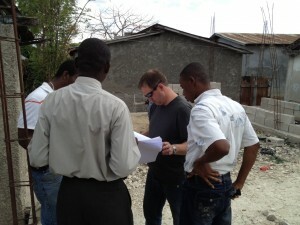 Discussion with teachers and Principal Saimplice on school construction and schedule.